I’d like to create an integrated television set that is completely easy to use,’ [Steve Jobs] told me. ‘It would be seamlessly synced with all of your devices and with iCloud.’ No longer would users have to fiddle with complex remotes for DVD players and cable channels. ‘It will have the simplest user interface you could imagine. I finally cracked it. In the past two months since Walter Isaacson's biography hit the bookshelves and people read that paragraph I quoted above, rumours of an Apple TV have hit a fever-pitch. Only a few people really know what Jobs meant by the quote and what his intentions were, but regardless, many people have speculated on what it is he "finally cracked". I've been following along closely to the discussion because I'm fascinated by where the TV industry is inevitably headed and because I want to see how Apple will come into another new industry and try to disrupt it (presuming they do, of course). More than that, I am some what of an outsider to the latest developments in the TV industry - living in Australia where TV content offerings are years behind that of the US and (to a lesser extent) Europe. Local TV stations have (forever) been slow in acquiring US content, taking weeks, months, if not years to show a popular US series and our online choices have been minimal - with the exception of ABC iView and some dismal options from other networks. So it is with this point of view, that I want to take a crack at figuring out what exactly this new Apple TV will be, why Apple wants to build one and how it might change our consumption of content. Jump the break to read it all. Why is an Apple TV Important? It is important to recognise that going forward, hardware and even software will become increasingly unimportant for consumers when deciding to purchase consumer electronics - what will (and has, to some degree, already) become more important is the ecosystem that supports these devices and the experience around them. Apple recognised the importance of the ecosystem early when it launched the iTunes Music Store - it launched the service, not because it wanted to become a music seller but because it wanted to sell more iPods. They recognised it was difficult for consumers to get music onto their iPods - particularly if they wanted to do so legally. Launching the iTunes Music Store allowed consumers to easily purchase music to load on to their iPods. I would argue strongly that without the iTunes Music Store, the iPod would have never become as popular as it was. As the years have passed, Apple has strengthened its iTunes Store, adding Movies, TV Shows, Audiobooks and iTunes U and the store has been a huge success. 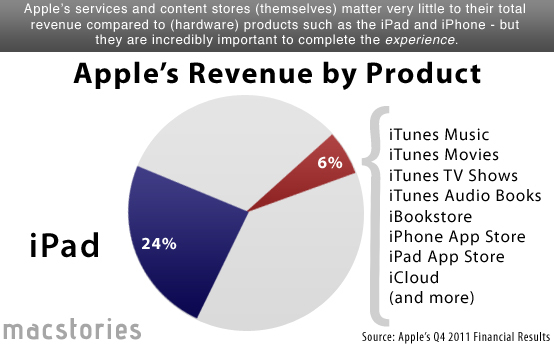 Billions of songs, hundreds of millions of TV shows and movies have been purchased, and yet the revenue from the stores represent only 6% of Apple's total revenue - and many think the store is only just above break even when you take into account costs. So if the iTunes Store isn't making Apple money (or very little in comparison), why have they put so much effort into improving and expanding it? The answer is because it gives their hardware devices access to an ecosystem that their competitors don't have access to. An ecosystem that makes consumers lives easier and one that has most of their entertainment needs covered. In just the past 5 years, Apple has strengthened their ecosystem with the addition of the App Stores, iBookstore and then with MobileMe and iCloud this year. iCloud is a particularly pertinent example of this idea that an ecosystem of services will become increasingly important. Looking back at MobileMe, it would be fair to say it was a failure - it launched to large issues and then never really became that popular. Why did Apple then refocus its efforts and launch iCloud, a significantly beefed-up service and then offer it to all iOS users for free? Because Apple recognised that there needed to be a service to sync your content across devices to improve the experience of using Apple's devices. So now Apple has services for virtually all the content you could need, a service to sync it all across your devices as well as other services from Game Center, iTunes Ping and iTunes Genius to further improve the experience and cohesiveness of using an Apple hardware product. None of these services are technically necessary for the hardware products such as the iPhone and iPad - just look at some of Apple's competitors they are exactly that - roughly equivalent in hardware and software but are not linked to an ecosystem of services, and in my opinion it's part of the reason they aren't doing as well as Apple. Where does the TV fit in? With all that in mind, when you look at the TV at the moment, you could have an Apple TV but if you have ever experienced using one, you can tell that whilst there is a link to Apple's ecosystem, the services themselves aren't as strong as they are for the iPod or the iPad. You look at the hardware of the Apple TV and you can tell that isn't really the problem (putting aside the idea for integrating it into a display), the software could be improved but again it's not that much of a deal breaker. But there just isn't a compelling reason to have one, competitors can do most of the same things, if not more (e.g. Xbox 360) - features like AirPlay or Photo Stream are cool and unique but they aren't enough. Yet despite Apple so far pursuing its Apple TV as a "hobby", it must have surely realised that as the battle around an ecosystem of services heats up (with competitors such as Microsoft, Google and Amazon), having a compelling product (and accompanying services) for the TV will be critical. The TV is a product that many of us use for at least an hour or so each day - and it really hasn't seen significant disruption at all in the past decade. So for Apple to protect its position of strength in the consumer technology space, it needs to be sure it can provide a product that covers the TV and gives its customers another reason to stick with them. If Apple fails to deliver a product for the TV, it might see customers slowly move over and use a competitor's TV product - such as the Xbox 360. Slowly but surely, these customers will start to use and embrace Microsoft's ecosystem of services (Zune, Xbox Live, etc) and will find it easier to then drift away from Apple's products to Microsoft products. Compare that vision to one where Apple has launched a successful product and accompanying services for the TV. In this reality, customers will have even less reason to jump ship to a competitor because unless they are unhappy with Apple's delivery of those services, they would have to completely readjust and transition to a new ecosystem - a very painful transition and it may not be as complete or cohesive as Apple's. Quick Note: Some will call this an example of Apple's "evil" walled garden - the truth is that it is a walled garden, but the truth is also that Amazon, Microsoft and even Google are developing their own walled gardens that feature services and content exclusive to their platforms. Apple may be less willing than Google to develop apps for their competitor's ecosystems but this isn't true in every case and is also a symptom of how the two companies differ in earning revenue. Apple earns the lion's share of its revenue from selling hardware, Google earns most of its revenue from ads - so it is merely logical that Apple would be more restrictive in developing for other platforms (less reason to buy an Apple device) and Google would typically develop for other platforms (more users for ad revenue). It's silly to call either company evil because of this inherent business model - but it is personal choice for which you choose to be associated with - or locked-in if you will. Contrary to an iPhone, iPad or MacBook, an Apple TV has a much narrower use-case. It is unlikely that you will be doing much more than consuming content - mostly TV shows and movies but potentially also music, photos and apps. With that in mind, I think it is more important to focus on this side of what the Apple TV will be - rather than the physical aspects to the Apple TV which i believe to be of secondary importance. First things first, Apple doesn't enter a market or industry unless it feels it brings something new to the table - something significantly new or disruptive. It may build upon products/technologies that already exist, but it will be a big step up - just look at the iPhone or iPad. So in my opinion, don't expect it to act like a TiVo or DVR, connecting to your existing content "pipe" and recording that stream of information for later playback. That's just a hack and doesn't bring anything new to the table. There's a reason Apple has been holding off from entering the TV industry 'properly' - it doesn't make sense that they would wait this long to just replicate a TiVo. No, forget about your cable, satellite, antenna or however you get your TV now. Apple is going to do things its way - and it's all about the Internet. My belief is that Apple will give users two ways to watch content - live or on-demand. Live TV might sound like a bit of a relic from the traditional TV service, something that one might think Apple would like to forget about. But I think Apple realizes that it still has an important role and would be something that content providers would not like to forget about anytime soon. Think of this as the iPhone still having the old number pad in the Phone app - despite Jobs' hesitation about that feature. (Shawn Blanc explains Jobs' hesitation well in his article on iOS 5 - see the 'Last Century' section). So how would this 'Live TV' work? At its core it wouldn't be that different to what your current live TV channels are. It would simply be an Internet stream of what you might already get via cable or antenna. Of course there would be some enhancements that add to the experience such as more information about what is currently being streamed and support for the iOS companion app (this is detailed below). So why is a live TV option important for the content strategy of the Apple TV? Some people enjoy channel surfing when they have nothing specific in mind for watching. Although live TV will be featured prominently, Apple will really push the video-on-demand aspect of the Apple TV. In my view there are three aspects to this feature; it will comprise of individual episodes on demand, season pass and provider pass - I've detailed all of these below. Individual Episodes on Demand: This is the easiest feature to explain because it already exists on the Apple TV and iTunes. It is the option to instantly start watching any TV episode for a small cost. I imagine this will continue to be an option on the Apple TV. Season Pass: Likewise, this feature already exists, it allows you to purchase all episodes of a particular TV season in one hit, with a slight discount (when compared to buying each episode individually). Apple actually improved this feature recently with the ability to "Complete My Season Pass" - allowing you to get a further discount on the cost of the pass if you have already purchased some episodes individually. I imagine this feature will be heavily marketed by Apple as it is very handy. Provider Pass: The third aspect to this video-on-demand strategy in my view would be this "Provider Pass" that gives users the option to purchase all of a content-provider's new content in a particular year. Think of it as similar to how the iTunes Match subscription works, a yearly subscription to that channel that automatically renews. It would give users episodes of virtually all (new) seasons that run during the subscription period and you get to keep them forever as purchases. This probably wouldn't be that cheap but would give fans of a particular provider access to all their new seasons at a discounted rate. What about all the independent producers of content that have sprung up with the advent of internet content like Revision3 or TWIT.tv? I think they would be treated like the traditional content providers, eligible to have their own live stream if they wished and distributing their content on the store. With the Apple TV, the line between internet channel and cable channel should be invisible because it would all get distributed via the internet through the iTunes Store. It would be similar to the iTunes Music store, where anyone can submit their music to iTunes for sale. Alternatively, these producers could also develop their own apps if they want to do something different - but it really wouldn't be necessary. All content would be treated equally on the iTunes Store. In the month since I purchased my own (current-gen) Apple TV, I've noticed that I rarely actually interact with the Apple TV itself. Instead I've typically just used my iPad to get the content I want to watch (whether it be iTunes TV shows, something from BBC iPlayer or photos from my Photo Stream) and then AirPlay it to the Apple TV. I do this simply because it is easier to do and a more powerful form of interaction. Realizing this, it occurs to me that it would make sense for the Apple TV to have strong connections to iOS devices. It obviously can't rely on them for control input - because not everyone who will buy an Apple TV will have an iOS device. But most people will, so it would make sense to extend and enhance the capabilities of an Apple TV through iOS devices. Be an alternate interface so that you could control the Apple TV using your iPad or iPhone rather than the simple remote. List of purchased shows for remote watching (iTunes in the Cloud). Although Apple hasn't really embraced social, they have tried to go along with it and have numerous services that are social in nature (iTunes Ping, Game Center, Find my Friends, Twitter in iOS 5). None of them have really taken off, but with an Apple TV, Apple has a chance to relaunch Ping and try do something a little more interesting. But I'd first like to address the social aspect of the Apple TV in a home environment. Unlike the iPhone and even the iPad, a TV is typically a communal device that is shared by a family or housemates, with often more than one person watching at a time. So how does the Apple TV work in such an environment? I think this is another area where iOS device connections can come in and provide additional benefits. Using the Bluetooth 4 technology, an Apple TV could survey which devices were near enough to be watching a show (similar to this) and put out a notification to that device, asking if it wants to tell iTunes Ping that it is watching a show. These options could obviously be customized so that it either automatically does this or never shares with Ping. Going further, you could then invite your friends via Ping to join up and watch the show - even interacting with iMessage to chat about it. 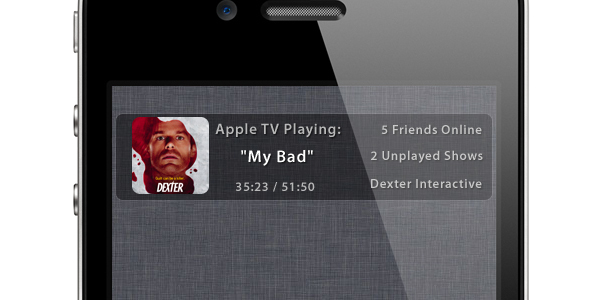 When using the interactive content aspect of the Apple TV app, shows could have a social aspect. For example, imagine a quiz show, you could play along by yourself or with your friends as the questions are being answered on the show. The possibilities here are endless. Whilst I don't think apps on the Apple TV will ever be as big or as important as they are on the iPhone or iPad, they will still play a big role and shouldn't be ignored. Plus, one must never underestimate developers, because whilst we might not have a concrete idea on what would be really good as an app on the Apple TV, developers will undoubtedly impress and surprise us with what they can accomplish. Games: Real Racing, Infinity Blade, GTA, Whale Trail, etc - use an iOS device as a controller. Is it a TV, is it a box? One of the biggest unanswered questions about this new Apple TV is whether it will be a standalone TV with the software inbuilt, whether it will be a separate box that connects to your TV (like the current one does) or if it will be both or something else that no-one has thought of yet. My opinion is that it just has to be both. If Apple was to enter the TV business as a means to more profits, and not just continue the business a hobby, it really needs to have a symbolic entrance and come in with a large, stylish TV to draw attention to it - the small hockey puck box just won't cut it. Of course Apple doesn't just make symbolic moves, they make calculated decisions that make sense from both a business standpoint and from a consumer experience perspective. This is why the integrated TV also has another (huge) benefit as many have pointed out - everything is ready and there are no hassles. But releasing a TV and making that the only way to experience Apple's vision of TV is strange and illogical for a number of reasons. People don't upgrade their TVs that often and even if Apple could convince most customers to upgrade every 3 or 4 years, it probably wouldn't be enough for Apple to make enough of a profit. Furthermore, many people would be unwilling to lay down the cash for a new TV set on the launch day - they may have recently bought a new TV or are still happy with their existing one. Selling a small, cheap box that can connect to an existing TV allows Apple to quickly gain a significant user base. Amassing a large user base is also important in corralling any content providers who may have originally held out from joining Apple - something that happened recently with the iBookstore. More importantly, people may be willing to more frequently upgrade this box (many might do so yearly, others every 2 or 3 years) and it is important to remember that Apple makes its money on hardware - despite the fact that the Apple TV would almost entirely be sold (marketed) on its content, software and the experience. Those features, don't actually bring the money in - which is why selling just a physical TV would not be in Apples best interest - despite it offering the purest and most unified experience. I honestly doubt Apple would do something fancy with the remote, it'll keep things simple (likely using the same remote as it does now) but potentially add a button to instantly activate Siri. Fancy swipe gestures don't work so well when you aren't touching the actual screen so don't expect a magic trackpad-esque remote control. So I think they'll keep things simple with a d-pad but emphasize Siri, iOS device connections and AirPlay. I've been using the new Xbox experience with a Kinect since it was released last month and one thing it has made crystal clear is that voice is the perfect interface for interacting with a TV. Kinect voice control is certainly a more primitive system of voice control than Siri on the iPhone is (it can only take commands for what is currently on the screen) but even that is amazing and so much better suited to interacting with the TV than an Xbox controller or remote. My favorite example of this is saying "Xbox pause" to pause any video that is playing - I don't have to pick up a remote (let alone turn on the Xbox controller which is probably asleep), activate the voice control or anything. It just works. Similarly, I hope Siri is always listening and doesn't actually require a button press to be activated. Siri, what new shows are coming soon? Siri, what is on tonight? How would Siri listen in to us? I think logically it would make the most sense if the TV or Apple TV box had some microphones embedded inside. The Kinect is more than capable to listen from that location and it is the most logical place to have it. Some have suggested the remote but that would require more batteries and probably a thicker remote - and what happens if you lose the remote! Oh and Siri on your iPhone should be able to answer a lot of these questions as well - it would be connected to the Apple TV (through iCloud) remember! Video streaming won't require much storage, just a minimal amount for caching, as the current Apple TV does. Apple won't offer the option to download any content, it'll all be streaming. However, because the Apple TV might run apps and games, it will require some storage. I suspect this will be either 8 GB or 16 GB (I'd lean toward the latter) - particularly when you consider games like Real Racing 2 and Infinity Blade II are already more than 1 GB. Apple won't publicise the sizes and won't give you a choice. As I indicated at the start, international rights and licenses have forever annoyed me, with my local TV stations being slow and/or unable to get all of the latest and best content from overseas (particularly the US). I don't think this issue of international rights will disappear right away - in fact I think the Apple TV will debut in the US for at least 3-6 months like most of Apple's new content services (e.g. iTunes Movies, iTunes Match, iBookstore, etc). However my hope and thoughts are that as Apple negotiates with various content providers, the arbitrary lines that define where content is allowed to be consumed fade away. It may take a few years (existing license deals will act as barriers to this vision), but I think just like music, the TV industry can be disrupted and to a certain extent, democratized. Because Apple's solution probably won't straight away have all your content, I suspect Apple will still include HDMI and other inputs on the actual Apple TV. This is also required because many people will want to use a game console, Blu-ray player or other device with their Apple TV - Apple may not like it, but it would be rather ridiculous not to have the option. We'd love to hear what you think the next Apple TV might be, so post your thoughts below in the comments section. I may do a follow-up post with some of the best reader ideas and thoughts!